Before I had kids, ask anyone, I had very specific ideas on childhood entertainment. Wooden, natural toys would dominate the house, not too many shiny loud objects with flashing lights and loud sounds, there would be limited cartoon character branding and of course no Disney princesses to set my daughters up for the notion of marrying to get your happily ever after..... and of course, screen time (specifically devices)would be limited. Enter from stage left, my two digitods.... a term I know is going to become more popular in the years to come. First of all, though the toys I bought (and still prefer) are usually wooden or more natural plastics (Melissa and Doug and Green Toys are my favourites). Do my kids like those though? No, they show a much stronger proclivity for the pink, shiny, glittery toys they've received as presents. Also, it looks like Disney threw up in this house. We have every Disney Princess ever invented! The greatest love-hate relationship I have is with my i-devices though. My kids adore them. Anjali can swipe to get her favourite apps and songs. I have to keep my stuff on high shelves, very well hidden and really limit their time with them. I worry incessantly about their eyes straining while staring at those tiny screens... especially since both D and I used to wear glasses. I also worry about social interaction. When other kids are around, as A is sometimes shy, she would reach for my phone and try to use it. I want her to be entertained by others, not by some flashing object. And what about activity and exercise for my kids? When we were growing up, we would spend lots of time outdoors burning lots of energy. With devices and this cold weather, it's like the odds are stacked highly towards the sofa spud factor. But then, the learning. There are very cool apps that reinforce their learning. 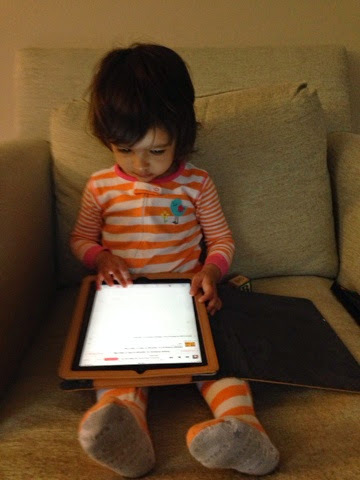 I have both a Cassia and an Anjali folder of apps including ones on reading, matching, shapes and colours. And not to bash them too much as the iDevices have saved me in many a situation. At restaurants or while shopping, I've busted out my phone several times.... I've finished actual meals, sometimes even dessert, because of my iPhone. And you try doing a 24 hour travel cycle without an iPad! No amount of wooden toys, tricks and games would entertain them as long as the iPad did! Many times home as well, if I need to finish cooking, some work or a blog post, I've guiltily given one kid or the other a device.... my kids have gotten an iNanny ever so often. So yes, I have an internal battle about the devices very often. A nomophobe myself, I'm not prepared to give them up but at the same time, I really try to limit their exposure to them.... both how, when, where and the amount of time they get on them. Just like TV, I also limit what they can actually watch or do on them and I've yet to actually buy an app for my kids. Got to go, Anjali woke up and is wailing for some attention... the iNanny to the rescue.... kidding!